Art is made by hands. But the hand is not always the willing servant of the mind. It searches, attempts, edges its way through all kinds of adventures. It tries its luck. The hand is action, it takes, it gives, it reveals. Sometimes it seems as if it thinks. Many artists have devoted their attention to the study of hands, from Rembrandt to Picasso. Henry Moore said: ‘The only worthwhile self-portrait is a portrait of the hands.’ Rodin drew very fast so that his hand would not be led by his head and could work in all freedom. There are also cowardly hands, such as those of Pilate who washed his hands and in this way sentenced an innocent man to the cross. Happily there are also hands of hope and opened hands – a universal symbol for hospitality. Dürer encouraged the end of the religious battles that divided his home town of Nuremberg in two camps. Look at those hands! Even though they stem from an earlier period in his life, are they not an artistic testimony to the willingness to beg God to end fighting, so that one would embrace an authentic faith free from all hatred? Look at these gnarled fingers that rise up and close themselves as to form a gothic arch. Is this not the first step to conquer temporary, transitory and ideological boundaries and go forward to the essence, to an encounter with the Creator of all things? 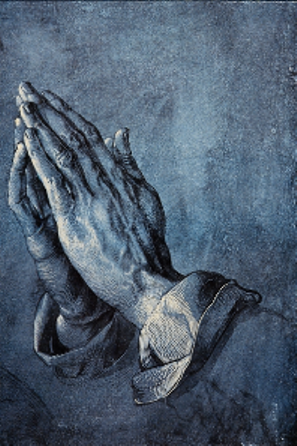 Albrecht Dürer: Praying Hands, 1508, 20 x 29 cm, Vienna, Albertina. It is a study for the hands of an apostle for the Heller Altarpiece commissioned by Jacob Heller of Frankfurt. The altarpiece was destroyed in a fire in 1729 and is known today from a copy. Francis appears weekly on television to talk about faith and art and to discuss works of art for the French Christian television program ZeMag (http://www.zebuzztv.com). He lectures and gives workshops about art and art history.